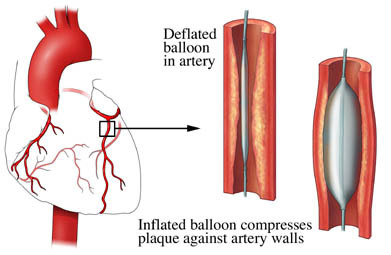 A coronary angioplasty is a procedure to open an artery in the heart that has become narrowed. This allows better blood flow through the artery and to the heart muscle. It is often done with a balloon that is passed through a special catheter (tube). Atherosclerosis is a disease of the arteries. Cholesterol and fatty deposits build up on the walls of the arteries. This restricts blood flow. When this buildup happens in a coronary artery, it can lead to a heart attack. Lifestyle changes and medications can be used to treat atherosclerosis. If they are not enough, an angioplasty may be done. Your doctor will likely do the following. Talk to your doctor about your current medications. Certain medications may need to be stopped before the procedure. You should take aspirin before and during the procedure. Your doctor may also prescribe a blood thinner before the procedure. Arrange for help at home after returning from the hospital. Local anesthetic will be given. It will numb the area of the groin or arm where the catheter will be inserted. You will also be given sedation and pain medication through an IV. This will help to keep you comfortable during the procedure. The area of the groin or arm where the catheter will be inserted will be shaved, cleaned, and numbed. A needle will be inserted into the artery. You will receive blood-thinning medications during the procedure. A wire will be passed through the needle and into the artery. The wire will be guided through until it reaches the blocked artery in the heart. A soft, flexible catheter tube will then be slipped over the wire and threaded up to the blockage. The doctor will be taking x-rays during the procedure to view the wire and catheter locations. Dye will be injected into the arteries of the heart. This will provide a better view of the arteries and blockages. After the blockage is reached, a small balloon at the tip of the catheter will be rapidly inflated and deflated. This will stretch the artery open. The deflated balloon, catheter, and wire will be removed. A small mesh tube called a stent may also be inserted into the artery where there was a narrowing. A stent acts to keep the artery open by providing support inside it. After the procedure is done and the blood-thinning medications have worn off, the catheter will be removed. Pressure will be applied for 20-30 minutes to control bleeding. A bandage will be placed over the groin or arm. The anesthetic should numb the area where the catheter is inserted. You may feel a burning sensation when the anesthesia is given. You may also feel pressure when the catheters are moved. Some people have a flushed feeling or nausea when the dye is injected. You may feel some chest pain during inflation of the balloon. The usual length of stay is overnight. If the catheter is inserted in your arm or wrist, you may be able to go home the same day. Speak to your doctor to see if this is an option for you. You will likely need to lie still and flat on your back for a period of time. A pressure dressing may be placed over the area where the catheter was inserted. This will help prevent bleeding. Or, a vascular closure device may be used to seal the site. This will allow earlier movement and hospital discharge. It is important to follow directions. You may be sent home on blood-thinning therapy. You can make lifestyle changes to lower your risk of complications of heart disease. These include eating a heart-healthy diet, exercising regularly, and managing stress. Sometimes the procedure is not successful or the artery narrows again. You may require repeat angioplasty or coronary artery bypass grafting (CABG). Cardiac procedures and surgeries. American Heart Association website. Available at: http://www.heart.org/HEARTORG/Conditions/HeartAttack/PreventionTreatmentofHeartAttack/Cardiac-Procedures-and-Surgeries%5FUCM%5F303939%5FArticle.jsp#.Wbra57KGNxA. Updated March 27, 2017. Accessed September 14, 2017. Complications of percutaneous coronary intervention (PCI). EBSCO DynaMed Plus website. Available at: http://www.dynamed.com/topics/dmp~AN~T917222/Complications-of-percutaneous-coronary-intervention-PCI . Updated July 26, 2017. Accessed September 14, 2017. Percutaneous coronary intervention. National Heart, Lung, and Blood Institute website. Available at: https://www.nhlbi.nih.gov/health/health-topics/topics/angioplasty. Updated December 9, 2016. Accessed September 15, 2014. Percutaneous coronary intervention (PCI) indications and efficacy. EBSCO DynaMed Plus website. Available at: http://www.dynamed.com/topics/dmp~AN~T114630/Percutaneous-coronary-intervention-PCI-indications-and-efficacy . Updated June 7, 2017. Accessed September 14, 2017. Percutaneous coronary intervention (PCI) procedure. EBSCO DynaMed Plus website. Available at: http://www.dynamed.com/topics/dmp~AN~T915838/Percutaneous-coronary-intervention-PCI-procedure . Updated July 26, 2017. Accessed September 14, 2017. Revascularization for coronary artery disease (CAD). EBSCO DynaMed Plus website. Available at: http://www.dynamed.com/topics/dmp~AN~T901116/Revascularization-for-coronary-artery-disease-CAD . Updated July 3, 2017. Accessed September 14, 2017.